It is part of my commitment to give quality time to parents. Please call the school to contact me. I am always available to meet parents. Enjoy a restful Labor Day. May God bless you and your family. Please check homework and assignment book, and stay in touch with your child's teacher. You are always welcome to make an appointment through the office. Use PlusPortals to access student directory, calendars, grades (grades 3 - 8) links to convenience lunch orders, school website and Mobile Archdiocese. Convenience lunch will begin September 4th. Please follow the uniform code. Thank you for preparing your children so beautifully for school. Remember the uniform shoes are solid black. Please NO TARDIES or EARLY DISMISSALS. It is not fair to your child and the classroom. Emergencies are ALWAYS an exception. 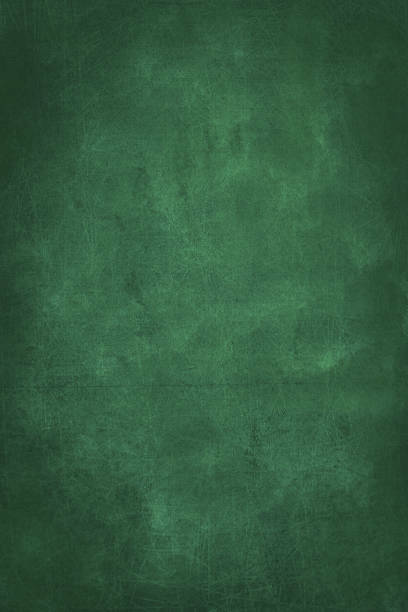 No Student may practice or play in games during a day he or she was not in school. 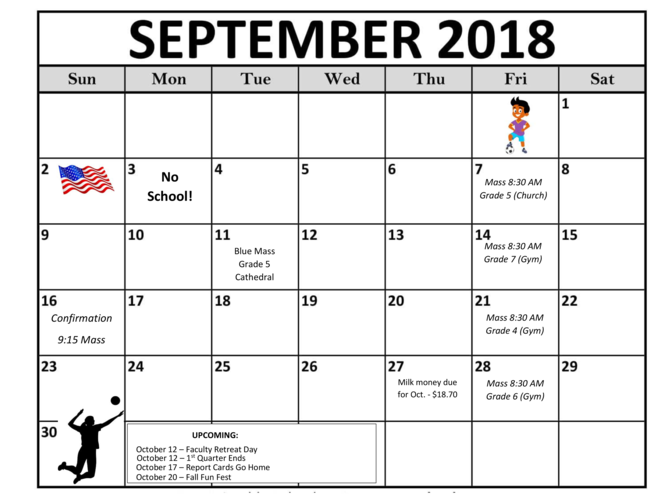 Students must attend school by no later than 11 AM in order to participate in an athletic event held that day, but only if the absence is deemed excused. If unexcused, the student is ineligible to play. Students who check out of school for reasons of illness are ineligible to practice or play in games later that day. 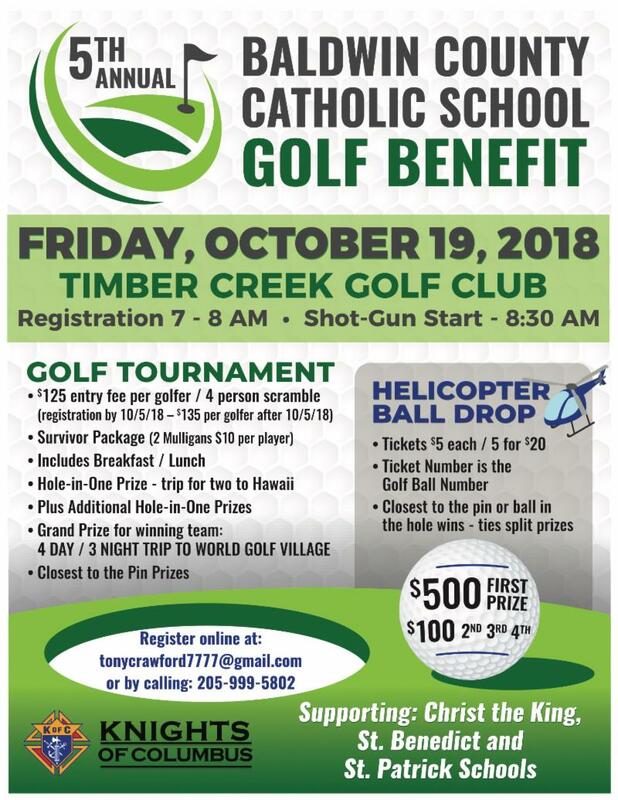 The Knights of Columbus will hold a golf benefit on Friday, October 19, 2018, at Timber Creek Golf Club. Proceeds will benefit our three elementary catholic schools—St. Benedict, Christ the King, and St. Patrick. It is a great fun day for golfers! There will also be a Helicopter Ball Drop. 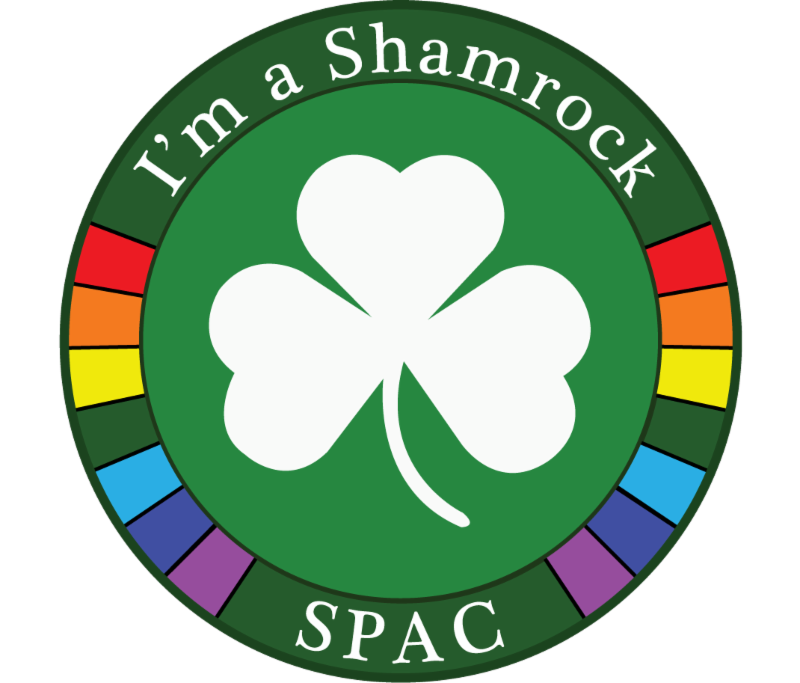 Tickets are available at St. Patrick School. Thanks for all your support!